Have a few hay bales left debating buying more or just starting to buy feed I do feed usually 3 times a week cubes. A guy in my town has some bales and will deliver for free but there 80 a bale and doing the math feel like i would come out better feeding I’m in east Tx I have 8 total 3 bred getting ready to calf this month through March and have cow with calf on her side as well as 3 heifers few months from breeding age. As well as I’m looking into buying in bulk and trying to find a cheap feed bin to purchase as well. What do you guys think I’ll be getting more cows as spring rolls around as well. But all of my cows are in good condition I usually put a bale out a week but my main question is if I feed how much do I feed a week and how much per head? You can build a bulk feeder pretty common around here. Tyco in Woodville and Cypress Creek in Buna has bulk feed in super sacks. This is not a great picture I will try get a better one. This feeder holds 3k pounds. The last time I was at Producer's in Bryan, they had some wooden bulk feeders for sale, but it's been a couple of years ago since I walked out back there. I have been considering just feeding bulk feed myself. Usually put out hay until mid March so it would be about a month of feed. I was also wandering how many pounds per cow for them to get by? This can get tougher than Chinese arithmetic. BCS of the cows, stockpiled pasture, winter forage if any. Get the protein to high and they will walk off pounds trying to put out the fire in their belly. This literally gets down to do you know your shyt. I have found a 2-1-1 mixture at 14% to be best for me of corn CSM and salt as a limiter. For cleaning up stockpiled pasture 1-1-1 builds a fire in their belly. Make it easy on everybody. Give those gals a roll of hay. They'd much rather have 25 lbs. of hay of any quality than 4-5 lbs. of cubes. Might not be the cheapest way to go but cows are in good condition now and should stay that way. Best wishes whatever you decide to do. I guess you could rig the creep feeder so they could get in. I have no clue how long that light weight creep feeder would hold up to grown cows. 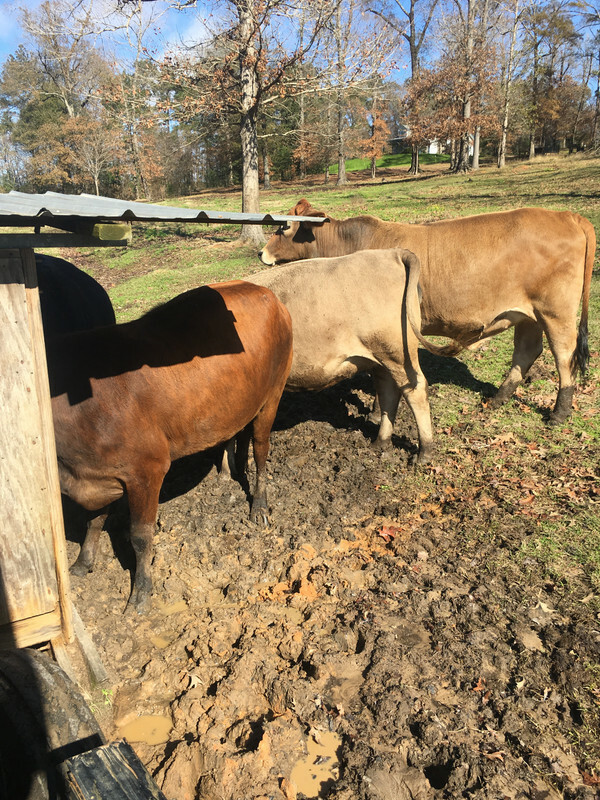 My crystal ball see a turned over creep feeder when three or four big cows get to fighting to get in that small trough. Consumption rate averages 5 to 7 pounds for my cows. 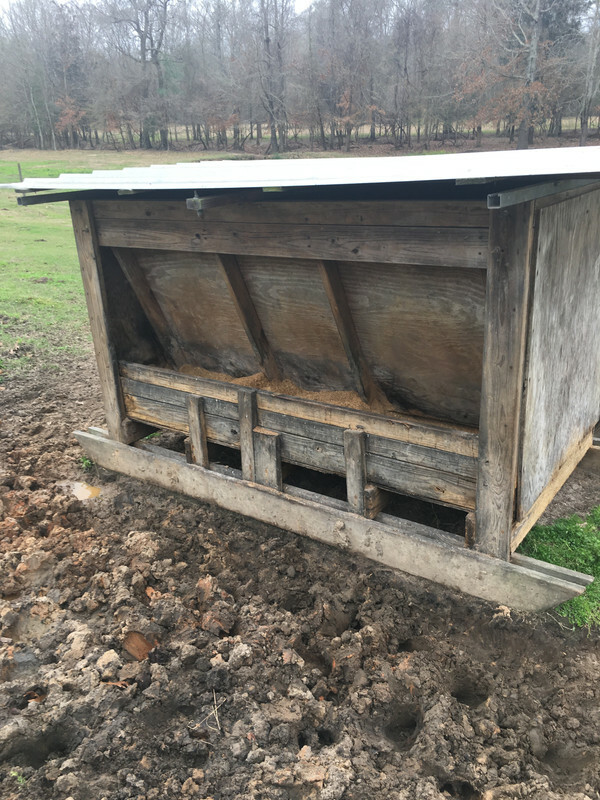 I built this feeder in 2011 for about 200 bucks I imagine in today’s dollars a little north of 300. 8x4x4 it’s 66 inches from the bottom of the skids to the top of the roof.